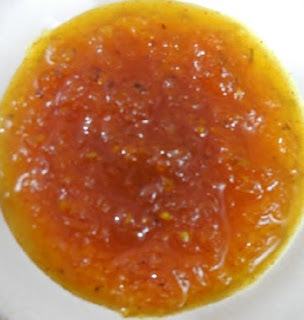 This is a very tangy and spicy gravy (kozambu) which can be prepared in no time. It tastes good with plain rice, chutney rice, and podi rice. The taste of Dosas, Idlies, Ven Pongal, Uppuma, Curd Rice and numerous other dishes is enhanced when served with a spoon of Vattal Kozambu. When Tara bought us a boxful of fresh dough nuts from Krispy Kreme we never thought that we would finish the entire box by the time we reached home. They were so fluffy, warm and so tasty and melted in our mouths, leaving us craving for more. We were so full that we decided to skip dinner that night. However,the sight of Vattal Kozambu in the fridge, tempted us to eat a meager morsel of vattal kozambu rice. After dinner we felt relieved and the feeling of heaviness had vanished! 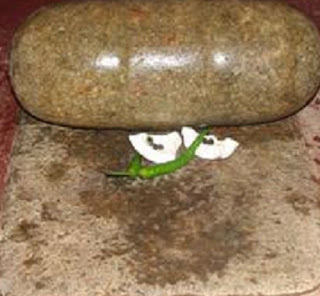 Pati (grandmother) prepared Vattal Kuzambu in Kall Chatti (stone vessel - see pic) and stored it for many days as an emergency supplement for other side dishes even in our pre-refrigerator days. 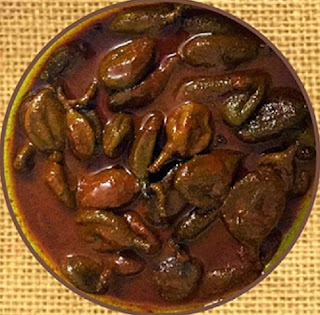 We loved those moonlight dinners, when Pati sat in the courtyard, under the star and moon lit sky, with a 'kall-chatti-ful' of vattal kozambu rice. All of us sat around her in a semicircle with our cupped palms outstretched for a portion (Tuttu) of the vattal kozambu rice. She served us so lovingly. Her animated stories about princes and monsters made dinner time much more interesting that we never took notice of the fast emptying of the kall chatti. Many a time Pati had to mix more rice as we wanted to keep eating till the story got over! Vattal of your choice – 1/2 to 1 tbsp, as per taste. Vattals are sundried berries and vegetables. Some popular vattals are 'manathakali' - tiny pepper sized berries, 'chundaikai' - larger and very bitter berries, and kottoranga - sundried cluster beans. 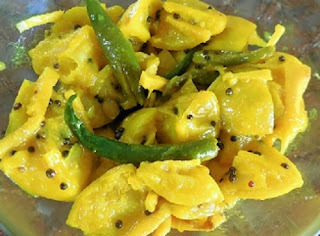 If you do not have vattals, you can simply add any fresh vegetables such as carrots, brinjal, pumpkin, cucumber, bitter gourd. 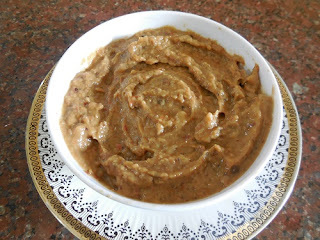 A tablespoon of groundnuts adds to the taste. 1) Soak tamarind in hot water for 20 minutes. Extract a thick juice, discard the fiber and seeds and keep aside. 2) Heat sesame oil in a pan and throw in asafoetida and mustard seeds. When they splutter, add fenugreek seeds and Bengal gram dal and roast till golden in colour. If you want you can add ground nuts at this stage as well. 3) Next add the broken red chillies and the vattals. Fry until they are crunchy and crisp. 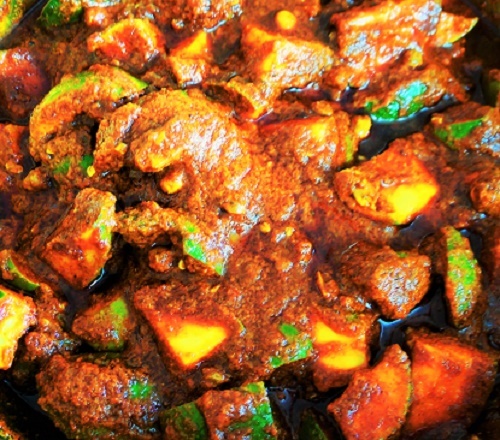 4) Slow down the flame and add the sambar powder and fry for two seconds. 5) Add curry leaves and stir. 6) Immediately pour in the tamarind juice. 7) Increase flame and add salt and jaggery. If you are adding fresh vegetables, you can do it now. 8) Let the kozambu boil and thicken until it gives out a very pleasant aroma. Remove from fire when the oil separates. 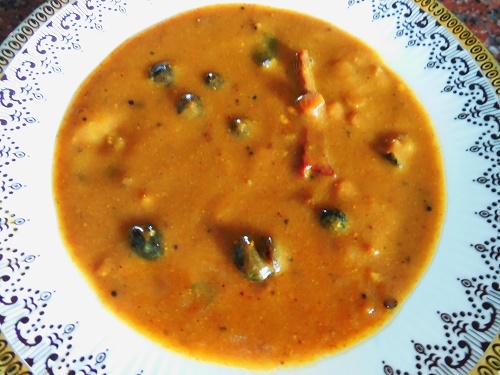 Relish Vattal Kozambu with hot rice topped with a spoon of ghee. CHUTNEYS - PART 2 CHUTNEY VARIATIONS THAT TASTE GREAT WITH IDLIS, DOSAS, VADAS, ADAIS, CHAPPATIS, BAJJIS, BONDAS! 1.) Grind coconut, roasted gram, chillies, ginger and tamarind with ½ a cup of water into a smooth chutney. 2.) Add enough water until you get the desired consistency It can be thick or like a sauce. 3.) Heat oil and season with mustard seeds and black gram dal. 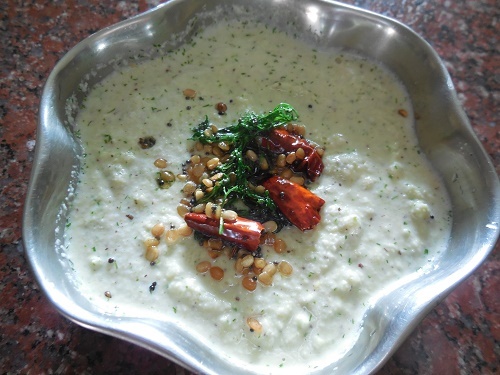 This white smooth chutney can be served with all snacks. Add a cup of freshly chopped corriander leaves while grinding . This will give the chutney a different flavour and colour. Instead of coriander, add a fistful of freshly chopped dill leaves while grinding. Heat oil and season with mustard seeds and black gram dal. When the dal turns golden brown in colour add a broken red chilly. When the chilly turns crisp add a spoon of chopped dill leaves and saute till they wilt.This adds a distinct flavour to the chutney. This is one dish that we can not do without . Whether it is breakfast or tea, lunch or dinner, chutneys have become an inseparable part of our daily meals. 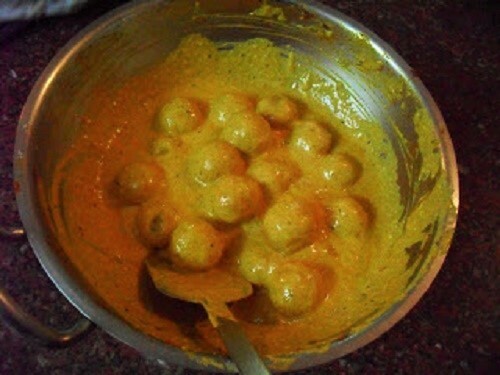 It is usually served as an accompaniment with the main dish. However, there are chutney buffs who are never tired of indulging in a chutney and rice as a routine. My great grand mother who lived up to the age of ninety six was very particular to have one variety of chutney every day. It was a treat for her sharp taste buds, and she could enjoy it with softly cooked steaming hot rice without having to worry about her missing dentures! Rajamma was her attendant. It was amusing to watch the short and stout lady and the big fat grinding stone (kuzavi) roll all over the stone slab (ammi) in an effort to a grind smooth chutney! As the culinary expertise is growing with the interaction of people from various cultures, lots of new recipes for this dish are evolving. There are two parts. 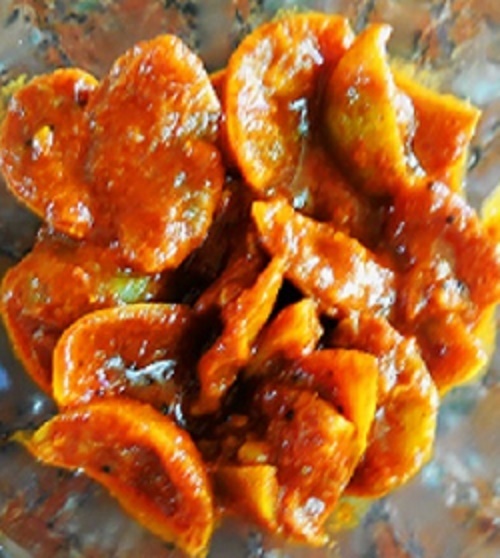 This part deals with the chutney variations that can be served with steamed white rice, along with a spoon of ghee or sesame oil; Part 2 will be posted soon, and has the variations that are served with snacks, idlis, dosas, sandwiches and so on. Here are a few basic chutney recipes. 1 .Heat oil in a pan and add asafoetida and mustard seeds. 2. When the mustard splutters add black gram dal and roast till golden in colour. 3. Add red chillies and roast till they are crisp. 4. Grind the seasoning coarsely with salt and tamarind, and 1 tbsp of the fresh coconut gratings. 5. Add the remaining coconut gratings and run the mixer for a few seconds only to blend with all other ingredients. 6. Scoop out the coarse chutney into a dish and blend once again with a spoon. 7. Serve with plain hot rice. 2. Add asafoetida, pepper corns and peeled garlic pearls. 3. Add red chilly, and both dals and roast till you get a pleasant aroma. 4. Dry grind the roasted ingredients and then add the coconut gratings and salt. 5. Add 1 cup of water and now wet grind the ingredients into smooth chutney. This chutney can be relished with steaming hot rice. 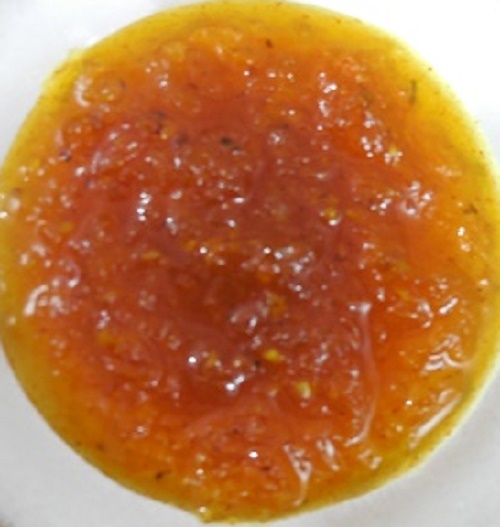 Chutney-rice tastes good when mixed with ¼ tsp of ghee or sesame oil. The best accompaniment along with paruppu chutney is roasted papad, and vattal kozambu tangy tamarind gravy with salted sun dried vegetables) or milagu kozambu (a spicy gravy with black pepper corns and tamarind juice). I will be posting these recipes soon. Tamarind – enough to roll into the size of a small marble. 1. Clean mints leaves and keep aside. 2. Heat oil and add asafoetida and mustard seeds. 4. Add red chillies and fry till crisp. 5. Add the cleaned mint leaves and sauté till the leaves wilt. 6. Grind all the above ingredients with tamarind, salt and a little water. 7. The texture must be slightly coarse and thick. Tip: Since the egg plant is cooked whole without cutting, make sure you examine the egg-plant that you choose. They should not have any holes on the surface. These indicate that there are worms inside the vegetable! 1. Wash and wipe eggplant thoroughly. 2. Rub 2 spoons of cooking oil all over the vegetable. 3. Roast it on an open flame or grill until the outer skin cracks. 4. Allow the vegetable to cool, and then peel off the scalded skin. 5. Slightly mash the cooked vegetable with a spoon or a fork. 6. Heat the remaining oil and add the asafoetida and mustard seeds. 7. Add the black gram dal and roast to a golden colour. 9. Grind all the seasoning coarsely with tamarind and salt. 10. Finally add the prepared egg plant and run the mixer to blend. Tip: Cooking eggplant in the above manner provides a delicious smoky, charred flavor. If however, you dot not relish this flavor, simply cut the egg plant into pieces and sauté in little oil, before grinding. 3. When it splutters add black gram dal and roast till golden in colour. 4. Add peanuts and roast till they crackle. 5. Add red chillies and let them become crisp. 6. Lastly add the cut tomato pieces and stir well. 7. Cover and cook on slow fire for 2 minutes or until the tomatoes soften. 9. Grind all ingredients with salt and sugar to smooth or coarse chutney as required. I like to call this the ‘joker chutney’ as it goes well with any and every dish. Onion pieces can also be added with the tomatoes, for a different flavour. My maternal uncle (Mama) was an agricultural officer, and he specialized in growing sugar cane. He lived in cool serene villages surrounded by trees and green fields. He had a ready stock of fresh green vegetables and fruits, and other farm produce at home. We visited him quite often and he took us round to show the age old temples and forts, and the forests and river sides around his place. His wife (Mami) was a very enthusiastic hostess. She treated us with all the ethnic dishes which she prepared with great zest. She was a specialist in pickles, jams, chutneys, vattals (salted and sun dried vegetables used in various preparations), and vadams (these are prepared with lentils, puffed rice, raw rice, beaten rice or sago, and sun dried and stored during summer. This could be fried and used as side dish or as a snack just like chips. )Mama took us on awesome walks through the gentle stream which wound through at the bottom of our lane and Mami fried hot bajjis and sent them to us with a boy with a delicious Pudina (mint) chutney to go with it.The eroding sand grains tickling our feet under the soothing cool water, and the melting of the hot bajjis in our avaricious mouths were unique experiences which can not be explained in words. I can never forget the speed with which Mami pickled the freshly picked mangoes though her hands were full with all the cooking and packing of the picnic lunch for our trips with Mama. Her mantra for a good pickle was “pick fresh, cook fresh and eat late.” Pickles do taste good as they age, as all the spices and seasoning take time to settle down in harmony. 1. Wash and dry the mangoes thoroughly. 2. Mix oil and turmeric powder into a paste and rub over all the mangoes. 3. Lay a fistful of mangoes in a clean and dry jar. 4. Spread little salt on the mangoes. 5. Add another fistful of mangoes. 6. Again cover it with salt, and repeat the procedure till all the mangoes and salt are over. 7. Cover the jar and allow it to stand for 2 or 3 days. 8. On the third day you will find the shrunk mangoes floating in a large volume of brine. 9. Stir well and drain excess water. 10. Add red chilly powder. 11. Powder the mustard seeds and fenugreek seeds raw, and add it to the pickle. 12. Stir well and enjoy with curd rice. 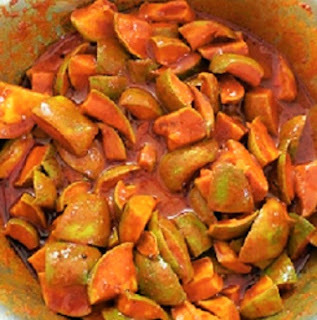 The preparation of Hog plum pickle is similar to Vadu mangai or baby mango pickle. 1. Wash and wipe the hog plums thoroughly. 2. Mix salt and hog plums together and store in a clean dry jar. 3. Allow it to stand for 4 or 5 days till the hog plums start floating in a large volume of brine. 4. See that the hog plums are covered with the brine and drain the excess brine. 5. Add chilly powder and turmeric powder to the pickle. 6. 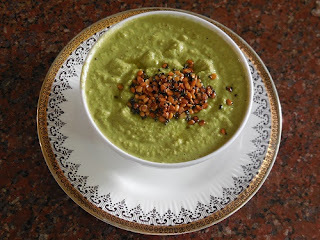 Blend mustard seeds and fenugreek seeds together and add to the pickle and stir well. 8. When the mustard seeds splutter add asafoetida and pour the seasoning on the pickle. All pickles taste better as they age. Here is Mami’s recipe for a mouth watering pickle prepared with the fresh juicy yellow lime, each the size of a badminton ball- which hung on the tree in her back yard. 1. Wash and wipe lime thoroughly. Cut each into 8 or 16 pieces. 2. Lay the lime pieces and salt alternately in layers in a clean dry jar. Cover and let the lime soak and soften in the salt for about 4 or 5 days. 3. Add chilly powder and turmeric powder, and do not stir yet. 5. 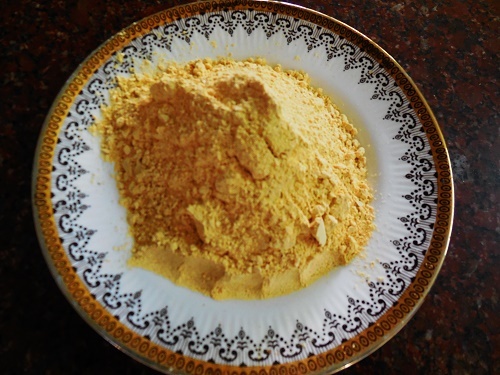 Fry the asafoetida and keep aside. 6. Add the mustard seeds into the hot oil and allow it to splutter. 7. Pour the seasoning and the oil over the powders. 8. Dry roast fenugreek seeds until dark in colour. 9. Powder fried asafoetida and roasted fenugreek seeds and add to the pickle. 10. Allow it to cool and then stir well so that the spices blend well. When the pickle settles, a thin film of oil should stand on the top protecting it from molds. Enjoy with curd rice, chapattis, dosas, bread or any other dish of your choice. Care should be taken to dry excess mango juice after cutting. Use a tissue to blot away the juice or allow it to dry in air before pickling. 1. Wash and wipe the mangoes thoroughly. Cut them into big pieces. 2. Lay the pieces and salt alternately in layers in a clean dry jar. 3. Heap the chilly powder and turmeric powder on the mango pieces. 6. Add the mustard seeds to hot oil and allow it to splutter. 7. Pour the seasoning and the oil evenly over the powders. 10. Stir well after it is thoroughly cooled and store in a clean and dry air tight jar. Cutting raw mangoes for Avakkai is an art. With the help of a sickle the mango is cut along with the tough seed so that each piece holds on to a small piece of the seed.This type of cutting needs a lot of tact and precision. If this is not possible, cut the mangoes into large pieces excluding the seed. 1. Wash and dry the mangoes thoroughly before cutting. 2. Cut the mangoes and sponge off the excess juice. Spread the pieces on a dry plate to dry. 4. Powder mustard seeds and keep it aside. 5. Take a bowl with a wide mouth and spread the mango pieces in it. 6. Add the chilly powder, salt, turmeric powder, mustard powder, whole raw fenugreek seeds and the chick peas. 7. Add oil and blend all ingredients thoroughly with a wooden spatula. 8. If the pickle is still dry, add more oil and blend till it gets a pickle consistency. 9. Store in a clean dry jar. 10. Allow the chick peas and the fenugreek seeds to soak and swell in the spice for a week. 11. Keep stirring the pickle with a dry spoon every day. 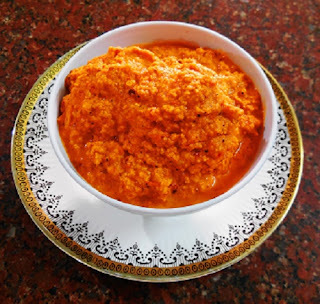 Enjoy the hot and pungent spicy pickle with curd rice. It can even be relished with steaming hot rice. 1. Wash and dry gooseberries thoroughly.With a sharp knife, make slits in the berries taking care not to cut them to pieces. 2. Heat oil in a pan and add asafoetida and mustard seeds. 3. After the mustard splutters add the prepared gooseberries and mix in half the salt and cover with lid. 4. Cook over low flame for 2 minutes till the berries are done. 5. Remove lid and add the remaining salt, chilly powder and turmeric powder and cook for 2 more minutes. 6. Remove from fire and allow it to cool. 7. Add one cup of whipped curd and blend well. 8. Store in a clean dry jar. The pickle with spicy curd gravy tastes excellent with plain hot rice. If you like the pungent aroma of raw mustard and fenugreek powder add the powder and blend just before removing from the stove. 1. Heat oil in a pan and add the grated mangoes and salt. 2. Stir in the red chilly powder and turmeric powder. 3. Cover with a lid and cook for 2 minutes in low flame. 4. Remove cover and add sugar and stir. 5. Stir vigorously till the sugar melts completely in the mango juice. 6. Now cook on high flame till it boils once and switch off the flame. 7. The pickle will have the consistency of a jam. Enjoy it with bread, dosas or chapaties and poories. 1. Wash and dry lime and cut them to pieces. 2. Wash and dry green chilies and slit them length wise. 3. Wash and dry ginger, remove the skin and cut it into thin slivers. 4. Combine all these with salt. 5. Heap the turmeric powder on the pickle. 6. 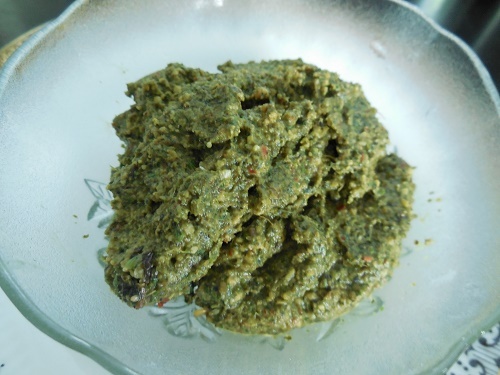 Heat oil and season with mustard seeds and asafoetida powder. 7. Pour this seasoning on the heaped turmeric powder. 8. Shake all the ingredients together and store in a clean dry bottle. In days of yore these lovely 'Oorugai jadis' or ceramic pickle jars were used for storing pickles for the large sized joint families, and they lasted for the whole year. 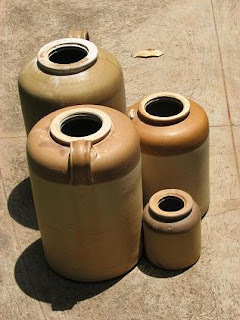 Nowadays they have become antique pieces used in interior decoration or as garden ornaments. Father bought all our groceries from a Society in the congested market place after mother wrote down the elaborate list. The provisions were loaded in a horse carriage (jutka) and brought to our house. Lingamma cleaned the groceries one by one with the help of winnows and sieves. Then mother stored them in their respective containers and bottles, and arranged them in the store room (Ugrana) shelves. After this, the sambar powders, chutney powders and other spice powders were prepared in bulk. Gowramma was especially summoned for this purpose. Gowramma was a short and frail person. Her well oiled, back combed pig tail was rolled into a tight bun, well above the nape of her neck. A black bead chain adorned her neck and she wore at least a dozen of colourful glass bangles on each of her hands. Her cotton saree always stood at ‘ flood level’. She wrapped her saree pallu masking her nose and mouth in an abortive effort to smother the cascading sneezes while she roasted the red chillies in the huge iron “bandli”, at the farthest end of the vast kitchen. Her half closed dreamy eyes, her protruding front teeth, the rhythmic jingling of the glass bangles while she pounded the spice in the enormous stone mortar and iron pestle– she looked a picture of a saint in meditation. 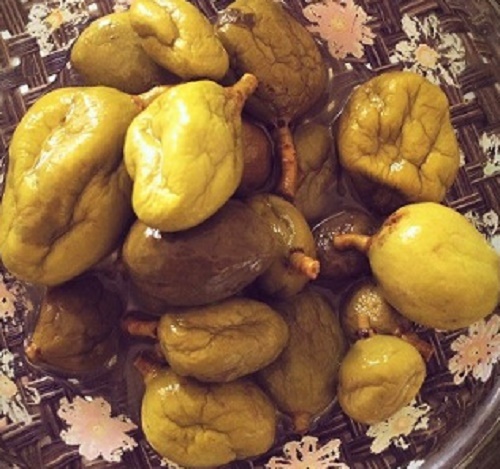 A simplified version of Gowramma’s recipes for preparing the ‘podis’ are given below. Mix all ingredients except red chillies and lightly roast in a preheated pan or sun dry all ingredients. Dry roast or microwave or sun dry chillies until crisp. 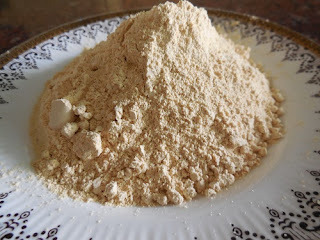 Powder all ingredients smoothly in a mixer. Cool and store in dry containers. This powder can be used in the preparation of sambars, spicy curries and gravys. 1. Heat a pan and dry roast all ingredients together till it gives out a pleasant aroma. 2. Cool and powder with salt into a slightly coarse powder. 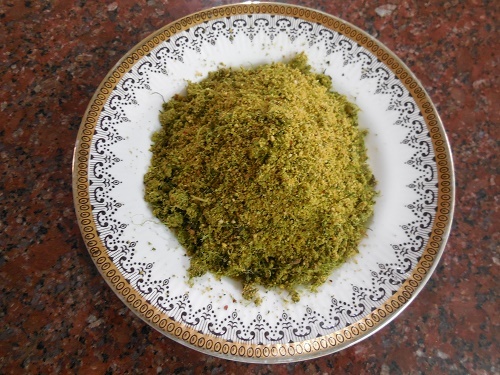 One spoon of Paruppu Podi with a spoon of ghee or sesame oil or olive oil, with hot plain rice is a delicacy. Vattal kuzambu (tamarind based spicy gravy) and roasted papads go well with Parappu Podi rice. 1. Heat oil in a pan and roast asafoetida. 6. 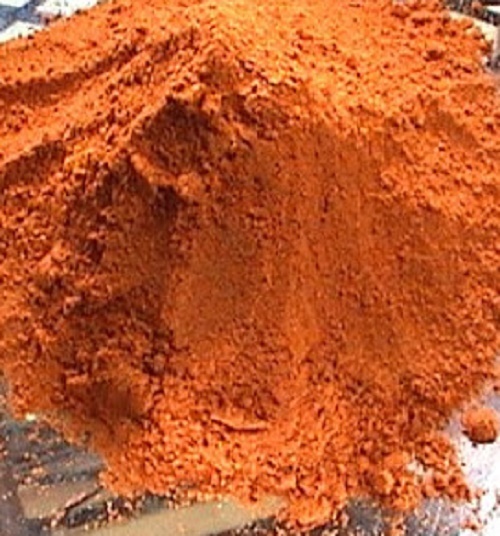 Powder the cooled seasoning coarsely. 7. Add the roasted coconut gratings and salt and run the mixer for ½ a minute so that all the ingredients blend together . 8. Cool and store the Tengai Podi and store in a dry container. 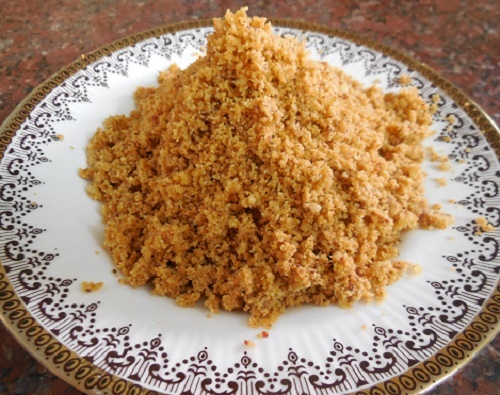 This delicious podi may be used as a side dish or savored with rice similar to Paruppu Podi. 1. Heat a pan and add sesame seeds and roast until it splutters. 2 Transfer the sesame into a plate and allow it to cool. 3. Heat oil in the pan and roast the asafoetida. 4. Add all the dals and roast to a golden colour. 5. Add the red chillies and roast till crisp. 6. Allow all ingredients to cool. 7. Coarsely powder all ingredients except the sesame seeds. 8. Lastly add the roasted sesame and salt and run the mixer for a minute. 9. 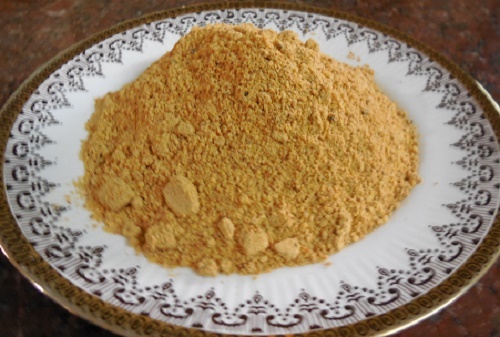 One tsp of jaggery blended with the Milagai Podi will tone down its sharp stinging taste. This podi with ghee or sesame oil or olive oil goes well with idlies, dosas and adais (A thick dosa prepared with rice, dal and spice). 1. Separate curry leaves from stalk to make 2 cups. 2. Wash and spread the leaves on a tissue to drain and dry. 3. Heat oil in a pan and add asafoetida. 5. Add pepper and let it crack. 6. Add cumin seeds and red chilly and roast for a minute. 7. Allow all roasted ingredients to cool down. 8. Dry roast the thoroughly dried curry leaves till they crack. 9. 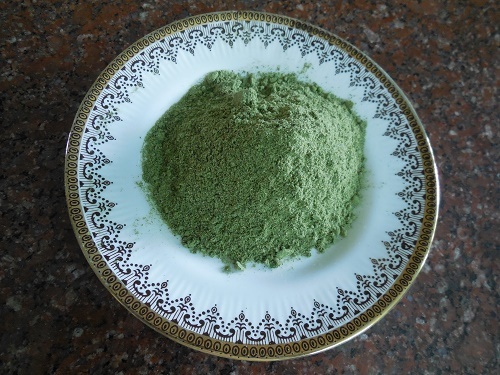 To preserve the green colour the curry leaves can be micro waved till crisp. 10. Cool all the ingredients and powder smoothly with salt. 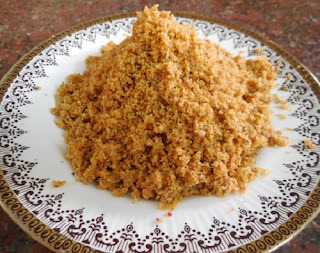 Karuvepilai Podi is a very good digestive. 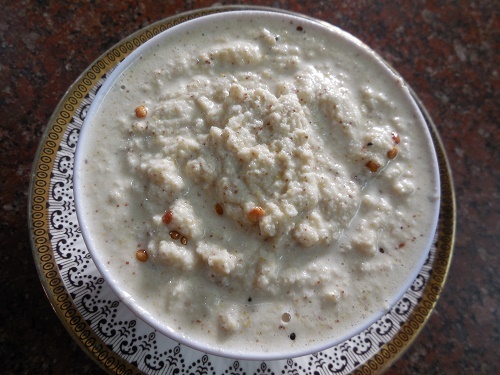 Enjoy with steaming hot rice and ghee or with curd rice. A dash of this podi in a glass of butter milk will make a refreshing drink. 1. Clean and chop the coriander leaves and allow to drain and dry on a tissue. Stalks can also be used provided they are tender. 2. Heat oil in a pan and add asafoetida. 3. Add the dals and roast till they are golden in colour. 4. Add red chillies and roast till crisp. 5. 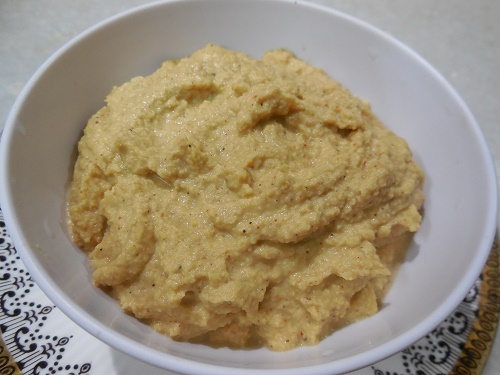 Cool all ingredients and grind coarsely with salt and dry tamarind. 7. Air on a dry plate. Break evenly if there are any lumps. 1. Heat oil and roast the garlic cloves till they turn golden brown in colour. 2. Add the broken red chillies and Roasted gram and roast till crisp. 3. Add asafoetida powder and stir till it emanates a pleasant aroma. 4. Cool all the roasted ingredients. 5. Add salt and grind into a silky smooth powder. 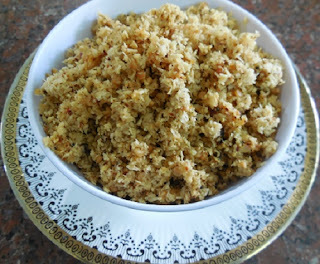 Enjoy the Andhra Pappu Podi mixed with steaming hot rice and a spoon of ghee or sesame oil.